Gametime Forecast: Upper 50s, mostly cloudy. Stats. In case you missed it, my Michigan-Michigan State stat chart. Run to win. The winner of this game has won the rushing battle 39 of the last 42 times. So there's that. 900. Michigan goes for program win #900 tomorrow. Following Michigan is Yale with 869, Texas with 860, ND with 853 and Nebraska with 846. Michigan State sits at 45th all-time with 638. MVictors' Willis Ward Blitz. MGoBlog breaks down MSU on film. MZone's always insightful Know Your Foe. UMTailgate's staff predictions. Kyle Meinke's 5 keys to win (hint: run the ball). Touch the Banner, Maize & Brew, BWS, MGoBlog. This is really the crux of the entire game. Michigan's offense against Michigan State's defense. Last year Michigan had a tough time doing anything productive, thanks in large part to MSU's pressure up front and a lockdown secondary, but also because of the 30-40 mph winds whipping around Spartan Stadium. They dominated the line of scrimmage and took away the Denard threat almost entirely. Michigan State controlled the flow of the game a year ago by playing very physical, and at times downright dirty. It was a very ugly game for a DE William Gholston who was suspended for a week because of a punch to the throat of left tackle Taylor Lewan who he battled with all day. There was also the ugly helmet twist on Denard Robinson earlier in the game. Watch out for #2 tomorrow. This year's edition of the Michigan State defense is not quite as imposing physically, but still every bit as capable of stopping this Michigan offense. 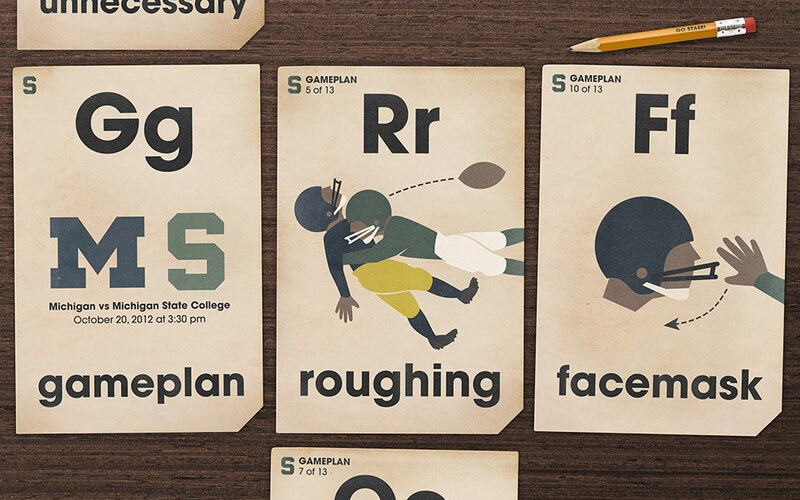 Yes, Michigan State has struggled this year, but they will be ready for this game. Denard leads the team in rushing, and he will be asked to do a lot on the ground tomorrow. What Michigan needs to do is get other backs involved in contributing. Last week Michigan used a 'running back by committee' approach to pounding the football against the woeful Illini defense. It worked well. Michigan must continue that same trend this week. Denard will not beat State all by himself. Michigan State blitzed like crazy last year and it proved successful. Expect more of that. They're going to run a lot of those A-gap blitzes that worked so well last year. They're going to force Michigan outside, to try and disrupt any sort of downhill running that works so well for guys like Fitz or Rawls. If they can bounce those guys outside and keep their shoulders turned towards the sideline, that will give Sparty a big advantage. The key to a Michigan win is certainly sustaining a running game. And the key to that is the play of the offensive line. They will have the biggest task tomorrow. They've been playing better and better each week, but tomorrow may be the biggest test of the season for that group. Michigan's defense should have a pretty good game tomorrow. Michigan State is woefully one-dimensional with RB LeVeon Bell being really the only legit big-time threat. TE Dion Sims is not listed on this week's depth chart, but he still could play tomorrow and I wouldn't be surprised. If he does, that gives Andrew Maxwell his favorite target back in the lineup. The rest of the receiver corps is very inexperienced, and frankly, just not that good at catching the ball. Michigan is 3rd nationally in passing defense (!!! ), so forcing a young and inexperienced Maxwell to throw as much as possible would be ideal. Bell is a pretty good running back and a real threat every time he touches the ball. It will be interesting to see how Michigan stacks up against the run tomorrow. I have a feeling they will rely a lot on their safeties to cheat up and try and disrupt the running game, leaving the corners and possibly Demens responsible for primary pass coverage duties. Up front, Michigan can control this football game. Campbell and Washington seem to be gelling nicely on the interior. Jake Ryan and Desmond Morgan should have big games as well. Michigan is primed for a big day on special teams, especially kickoff return. Michigan State ranks 115th nationally in kickoff coverage. That's bad news for the Spartans because Dennis Norfleet is primed to break one loose one of these days. Tomorrow could be the day. Punting-wise, Will Hagerup is solid as Sears. Punt coverage is a concern though. Jeremy Gallon has been fine with punt returns catching. Not to be overlooked is Brendan Gibbons. He's knocked home 7 of 9 field goals this season, with 6 of them coming in the last 3 games.